Image caption The Sutton Trust said the opportunities on offer to young people who did not go to university were "poor"
Apprenticeships in England need to be overhauled to stop many young people being awarded practical qualifications that have little worth, a report says. Compared with other European countries, many apprenticeships are low quality and too short, the Sutton Trust warns. It says thousands of apprenticeships should be created to boost the economy and improve youngsters' job prospects. 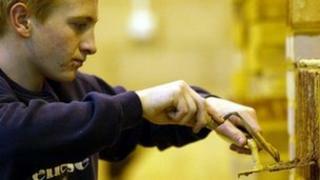 The Department for Education says apprenticeships are being reformed to "drive up standards". The Association of Colleges said some existing apprenticeships were respected by industry and should be preserved. The study, which was carried out by the Boston Consulting Group on behalf of the Sutton Trust, says fewer than 200,000 of the 520,000 apprenticeships starting in England every year are rated at level three - which is equivalent to A-level. The report cites figures that suggest apprenticeships are offered by just one in five (20%) of employers in England, compared with over half (51%) in Germany, which, the report says, is considered to have one of the best vocational education systems. Only 61,000 new apprenticeship starts were for young people, whereas in Germany, 570,000 new apprenticeships are for youngsters and 90% of these are equivalent to A-levels. The report also notes that England's vocational system has 18,000 different qualifications, while Germany has 330. The report warns that since 2010, more than half (58%) of apprenticeships have been below level three and three-quarters have been aimed at those over the age of 25, many of whom are already in work. And it warns 11 young people are competing for each apprenticeship. In his foreword to the report, Sutton Trust chairman Sir Peter Lampl said the report had found that, with some exceptions, the opportunities on offer to young people who did not go to university were "poor". The attitude in England, with some exceptions, was very different to that in countries such as Germany and Switzerland, he said. "Instead of a clear system of respected vocational routes, we suffer from a complicated patchwork where too many young people are offered qualifications of little worth in a system that confuses employers and is not valued as it should be by society," he said. He said the "cruel deception" about an expansion in apprenticeships, when many were below level three and the majority went to older workers, had to stop. The report calls for apprenticeships to be radically expanded, with up to 300,000 new starts each year. The majority of these should be at level three at least for three years, with some four-year courses at level four - higher than A-levels. No more than 10% of apprenticeships should be two-year courses at level two, it says. Sir Peter said: "Real apprenticeships are as important to social mobility as good university degrees. "Students facing huge loans for a university education find themselves between a rock and a hard place. Even if they would prefer to work with training, the lack of good apprenticeships means they feel they have little choice. "England's patchwork vocational system not only hinders our economic competitiveness, it prevents tens of thousands of young people from gaining good skilled jobs." Teresa Frith, from the Association of Colleges, said: "Creating 300,000 apprenticeships, when the report acknowledges there is already a shortage of apprenticeship places for 16 to-year-olds, would be a massive challenge and although we agree that there is a business case for employers to take on apprentices, at the moment too few do. "The report also says level three apprenticeships should be the priority. This isn't a bad idea in principle but some level two apprenticeships, such as those in construction, are well-respected by the industry and should be preserved. "The report is absolutely right to say that vocational courses should only be taught in institutions with high-quality facilities and expert teaching staff and that careers advice and guidance needs to be improved." A Department for Education spokeswoman said: "We are already radically reforming apprenticeships to drive up standards so that they are more rigorous and responsive to the needs of employers. "Since 2010 over a million people have become apprentices, providing a great start to their careers. We have already insisted that apprenticeships last for a minimum of a year, include more English and maths and that every apprenticeship is a job. "We have consulted on wider reforms to drive up standards in apprenticeships further, and will publish plans later this month."